Have you noticed that puppies love to dig? Digging is as natural to pups as eating, playing, scratching and sleeping! It is important to remember that ‘digging’ is only a symptom, not a ‘problem’. Attempting to just stop your puppy from digging is a lot like putting a Band-Aid on a broken leg. The first step to stop digging is to discover the reason that your puppy has chosen to dig! 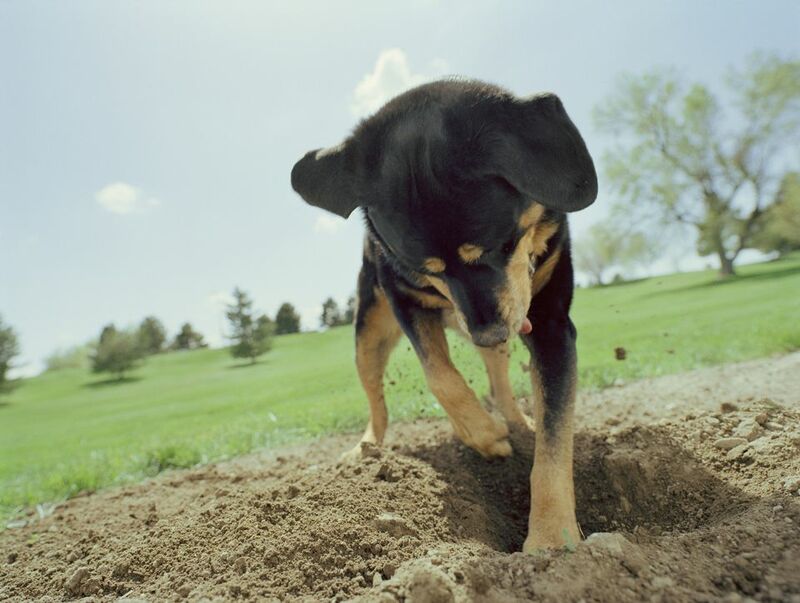 There are many breeds of dogs that have been selectively bred to dig! I have the word ‘Terrier’ literally translated as ‘Earth Dog’. This means that many Terrier breeds consider digging to be as natural as breathing! Hounds such as dachshunds burrow into the ground to hunt for vermin. Take a moment and read the various tasks your pup has been selectively bred to perform. (akc.org) You may be surprised to discover that many breeds and breed mixtures are ‘predisposed’ to look for prey in your flower garden! There are pups that love to dig cooling pits to escape from the sun. Many of the Northern breeds such as Huskies, Malamutes, Spitz, and Samoyeds instinctually understand how to cool themselves off. Again you will find valuable information by researching your pup’s breed or breeds for clues to her behavior! Have you ever experienced boredom? What behaviors do you do to entertain yourself to escape boredom? Are any of these behaviors wasteful or even destructive? It might be that your puppy finds digging to far more enjoyable than staring longingly at the back door! It could be that your puppy is simply having fun digging up your back yard. Is there any behavior that you do just because it is fun and you enjoy doing it? Are any of these behaviors something that you know might not be good for you? If you, the human, does things just because you enjoy them can you really be at angry with your puppy for just enjoying life? I invite you to really think about this concept! Some pups dig to pursue freedom. These pups seem to really believe that the grass is greener on the other side of the fence. You can tell that your pup’s purpose is freedom when she digs at fence lines or under walls. This reason for digging is the most dangerous for your puppy! What will she do if she manages to get under that fence? Your puppy repeats behaviors that she finds some type of reward in. She stops behaviors that do not produce some type of reward. You are wise to ask yourself what reward does your puppy receive by digging! The answer to this question is your clue to deter her digging. I encourage you to spend some time discovering the positive reinforcement your puppy gains from her digging. Your job is to change this positive reinforcement to a correction. If you are thinking this a difficult task you are correct! It is honestly easier to solve the behavior issues that prevent you from leaving your puppy indoors than to solve outdoor behavior issues. The reason for this is that most pups consider the yard to be their territory, not yours. Another reason is that because your pup is often outdoors alone there is no one around to direct her activities! As we move on to possible behavior modification techniques I invite you to remember this simple truth. You are the one who chose to bring an animal into your life- never be surprised when an animal behaves like an animal! I have had clients successfully deter digging by helping the environment to correct the pup’s digging behavior. These deterrents are usually not sufficient to deter instinct driven digging. Remember that your puppy will put her nose down as she begins to dig! Please ask your Veterinarian about the safety of any substance that you choose to use as a deterrent! This stops some pups from digging but teaches other pups to dig in new places. Visit a sporting goods store to purchase two or three Boat Horns. The horn is compressed air in a can that emits a loud sound as you depress a button. Watch your puppy from inside your house. As you see her start to dig open a window and sound the horn. The sudden sharp noise is likely to send your pup running from her digging activity. Please keep in mind that using sound to frighten your puppy may cause her to become afraid of loud noises such as fireworks and thunder. Use sound corrections sparingly! I have also had clients report that secretly burying their pup’s feces in the hole and covering the hole with loose dirt caused the pup to abandon digging. I suspect that this only really caused the pup to abandon that particular hole. Since the clients believed it worked you are certainly welcome to try it for yourself! Do not underestimate the benefit of increasing your pup’s exercise level! Tired pups do not dig - they sleep. A brisk morning walk being sure to include training before leaving your pup in your yard will do wonders. An alternative would be teaching your pup to safely walk on your treadmill. If you do not currently have a treadmill, there are puppy treadmills adapted for your pup’s safety available for purchase. Consider having an underground fence installed around areas like flower beds and children’s play areas. This type of fence is very effective for deterring the freedom seeking pup that is trying dig under fences and walls. Basically, a wire is buried underground around areas that you do not want your pup to go. Your pup wears a collar that beeps to warn her that she is approaching the forbidden area. You will need to teach her that to avoid the electronic correction that follows the beep she needs to move away from the forbidden area! You will be wise to have a pest control company examine your yard for things like moles. Ridding your yard of vermin that your pup knows is there even if you don’t is a simple solution to instinctual hunting digging. Pest control is very effective for removing temptation from your pup’s life! It is important to ask yourself the question “Who’s yard is this?’ Just opening the door and allowing your pup to run into the yard is the second best way of letting your pup know that she owns the yard. Dog doors are the best way to tell your pup that she owns both the house and the yard! I do not have a dog door nor do I ever imagine a situation when I will have one. I want my own pups to understand that I pay the mortgage, therefore the house and yard belong to me! I am happy to allow them to enjoy both with my blessings and permission. I hope that if you use a dog door that you do not have any destructive issues either in your house or yard. If you do have issues then I encourage you to lock your dog door while you establish proper respect. I encourage you to learn the ‘Goalie’ exercise and use it each time that you allow your pup into the yard and back into your house! When was the last time that you went out to the yard with your pup to practice training? I invite you to reap the benefits of training at the scene of the crime! It does more harm than good to drag your pup to the hole to punish her for digging. It does a world of good to take her near her digging and practice training sessions! The message you are giving her is that you expect her to listen to you in the yard as well as the house. She will get the message! Skeptical? I invite you to try for two weeks and notice the attitude adjustments in your pup’s yard behavior. Let’s turn our focus from deterrents to current behavior to future planning! There are ways to restructure your pup’s yard to help her avoid trouble. My youngest grandchild, Charlie, loves to dig! She loves dirt, sand, mud puddles, sawdust - if she can dig her fingers into it, then she is delighted. In fact, in many ways, Charlie reminds of a lovable smart energetic Terrier! Her parents wisely installed a large covered sandbox to encourage Charlie to dig in a place they found appropriate. For the most part, it really solved the issue- and when it did not they a place to redirect Charlie instead of trying to punish her! Consider creating a digging spot for your puppy. You can use a corner of your yard or a child’s sandbox. Bury little treasures in the loose dirt for your puppy to find. Go outside and dig with her in her spot. If you find your pup digging in a spot that you do not like simply redirect her to her spot! This simple solution can you save you lots of anguish and time. Enrich your pup’s yard! Tie tether balls to tree branches and teach her how to play with the ball. Provide interesting puzzle toys to entertain your puppy. Install some fun backyard agility equipment, like a tunnel and a short A-frame or a slightly raised dog bridge. Spend some time observing what your puppy loves to play with! Provide her with fun activities to divert her attention from destroying your yard. In conclusion, remember that it is usually easier to solve the issue of why you do not leave your pup indoors, than to solve outdoor behavior issues! Do your best to give your pup good consistent exercise. Remember to train her both in your house and in your yard. Keep in mind the building blocks of a successful relationship with your pup - love, trust, and respect. Teach all family members that are able to learn to play the Goalie game as you allow your puppy to go into the yard and to return to the house. Spend the time needed to discover the underlying reason for your puppy choosing to dig! Remember that your puppy is your friend! Refuse to resort to punishment as it will not stop her from repeating the behavior but may damage your relationship! How Is Leg Lifting Different Than Potty Accidents?